Thomas and his family lived in and around the Chilvers Coton area of Nuneaton for most of their lives. 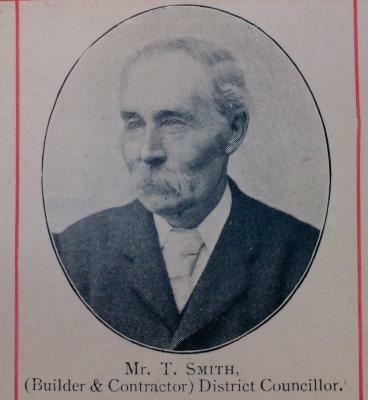 His parents John, a leather cutter by trade and May Smith, lived in Coventry Road when Thomas was born (1838). After the death of his father, May and the family moved to Coton Road. They were taken in by Thomas Hardy, his uncle, a local timber merchant, builder and brickmaker. The young Smith was a willing learner, his uncle decided to take him under his wing and taught him everything he knew. By 1871 an old and weary Hardy, aged 73, had affiliated Thomas into the business and was now ready to pass over the reigns. The 1880's had arrived and he was in sole charge, employing 60 men and 21 boys and was married with 5 children, things were going great. Taken from plans of Manor Court built for Reginald Stanley. Thomas was known for his efficiency and good work, a trait that Mr Hardy had taught him well. This put him in a position to win contracts and maintain a reputation second to none in the town. He also had a bond with a certain Reginald Stanley and the two had a vision to help transform the town for the good of the people. One of those projects came in the form of the Nuneaton Cottage Hospital ,which you can read about on its own page. Thomas was involved in Stanley's Manor Court home, as well and the impressive Nuneaton Liberal Club on the corner of Stratford Street, along with many of the houses that were popping up all over the town. The Lascelles Directory of 1850 names a Mr Joseph Barnwell as quarry owner in the Attleborough area. The quarry then passed through a few different hands and eventually ended up with Thomas getting his hands on the business around the turn of the century. Mr Smith was also a prominent Councillor and sat on the Board of Guardians and Rural District Council for a number of years, helping to forge a better future for Nuneaton's citizens. Thomas carried on the business into his 70's, with the help of his two sons Thomas Hardy and Henry John, working from their home. Unfortunately during 1912 Thomas was taken ill. It was recorded that "After a long and painful illness, the deceased succombed to a complication of the diseases at his home". The local papers of the time stated that a highly respected townsman, that had took a prominent and active part in the local government, had passed away on the 17th February 1913. He was buried at Coton Parish Church, but my search for his grave to now has drawn a blank. 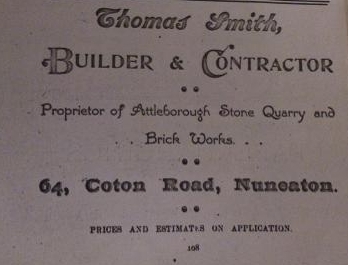 Thomas Smith played a big part in changing the face of Nuneaton in those heady day of the late 19th early 20th century. Thanks Mr Smith for building some amazing buildings.